The unmanned aircraft Sagitta has successfully completed its first two test flights at the Overberg test range in South Africa. The project is part of the "Open Innovation" initiative launched by aircraft manufacturer Airbus. The objective is the development of new technologies for unmanned aerial vehicles. Sagitta serves as a platform for testing these technologies and is not focused on any specific end-product. Researchers from the Technical University of Munich (TUM) answer for the overall configuration, programmed the flight control system, investigated the aerodynamic phenomena and developed flexible materials for Sagitta. Small quadrocopters deliver packages door to door, air taxis carry their passengers through the city: In the future Unmanned Aerial Vehicles (UAVs) will be a part of our everyday lives. But there are still many challenges to be overcome in the field of autonomous aviation, for example the safety of the UAV. The questions that have to be addressed here are similar to those raised in connection with autonomously driving automobiles. For instance, according to which criteria the system makes decisions when a dangerous situation occurs. The aircraft manufacturer Airbus launched the Open Innovation initiative Sagitta in 2010. The objective of the project is to develop various technologies and innovative approaches in partnership between industry and research institutes; these are then to be tested for viability in real aviation using the Sagitta demonstrator. The results are public. Four chairs at the TUM as well as a focus group of the Institute for Advanced Study (IAS) are involved in the project. "Sagitta is a flying wing: that means that the fuselage and wings are connected seamlessly with one another and form a single unit," explains Prof. Mirko Hornung, head of the Chair for Aircraft Design at TUM. Sagitta comes from the Latin word for 'arrow'; seen from above, the UAV has the geometrical shape of a diamond and thus resembles an arrowhead. The objective of this design is to keep Sagitta's radar signature as small as possible. The team from the TUM Chair for Aircraft Design was responsible for investigating the mutual interactions of the individual components and thus for the design of the overall concept. They also developed an innovative steering concept for Sagitta, an innovative flap system for steering and stabilizing the UAV. "In our concept we use among other things certain aerodynamic flow effects on the inside to make the flaps more efficient and thus smaller," Hornung explains. The engine's propulsion thrust is also used in steering. How will Sagitta behave in flight, how will the UAV react for example to wind gusts and how great is the aerodynamic drag when the flaps are open or the engine is extended? This data is essential when developing flight steering and flight control systems. Scientists of the Chair of Aerodynamics and Fluid Dynamics tested two 1:3 scale models of Sagitta in the wind tunnel. 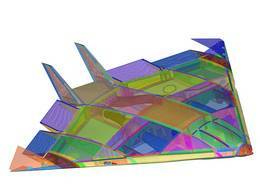 The wind tunnel tests were enhanced with numerical aerodynamic simulations. "Until now there has been very little in terms of aerodynamic investigation on this kind of configuration," explains Prof. Christian Breitsamter. Sagitta has a small wing-span, with the leading wing edges highly "swept" towards the back. This configuration results in special aerodynamic phenomena such as leading edge vortex systems. It is thus very important to test how these phenomena will actually impact physical flight characteristics. One major challenge with the UAV is ensuring its safety. When unexpected disturbances, for example system errors, wind gusts or turbulence occur, the system has to be able to take the proper remedial actions, since there is no pilot on board who can react directly to the critical situation. The TUM IAS focus group "Aircraft Stability and Control" worked together with the Chair for Flight System Dynamics to develop an innovative flight control concept. In configuring the flight control system, the engineers had to take into account the fact that the UAV would behave much differently in real practice than it had in the preliminary simulations. "We deployed the flight control system in such a way that it can cover the widest possible spectrum of these multiple uncertainties," explains Prof. Matthias Heller, head of the focus group "Aircraft Stability and Control" at the Institute for Advanced Study (IAS) and the Chair for Flight System Dynamics. The tests were extremely successful, with Sagitta completing both flights on a fully automatic basis. When a bird changes the direction of its flight or uses air currents for lift, it changes the position of its wings almost effortlessly, and its flight is noise-free. Movable rudders and flaps are built onto the outside of aircraft to fulfill the same purpose. When they change their positions, crevices and uneven surfaces result. "Air can no longer smoothly flow past the material at these points," explains Prof. Horst Baier of the TUM Chair for Lightweight Structures. This is inefficient for flight behavior and results in noise. "Our objective is to make the control surfaces as smooth and flexible as a bird's wing." In order to do this, the scientists of the Chair developed new materials and construction techniques. Here soft plastics guarantee maximum flexibility, and are reinforced with stiff fibers that make sure the aircraft can withstand the substantial forces to which it is subject. The team has already tested the materials in a computer model and in the wind tunnel. They'll be put to the practical test on Sagitta's next flight. Several research institutes of the DLR, the Bundeswehr University Munich, the Ingolstadt University of Applied Sciences as well as Technical Universities of Chemnitz and Munich are participating in the Airbus project Sagitta.